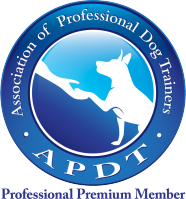 Dog body language is an essential element in dog training and any pet professional working with dogs should have a basic understanding of it. Dogs communicate between each other with sounds (barking, whining, etc. ), body signs and scent. Unfortunately, we are unable to communicate with scent with them and they are not very good at understanding human language. Body language is something we can learn to understand and they are very good at already! Your dogs knows when you are scared, alert, relaxed or stressed because he watches your body position, your facial expressions all day long. They also try to communicate with us using body language but we often fail to get the message. This is the introduction to a series of articles about dog body language to teach you to see and understand what your pet is telling you. 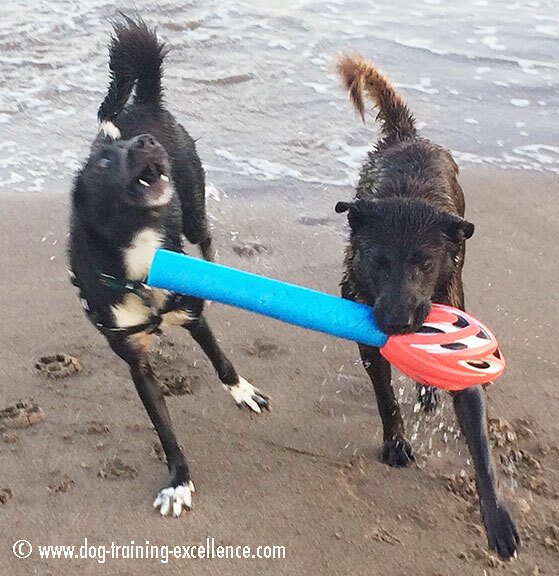 Distinguishing between threatening and friendly cues can save your dog from a potential aggressor and prevent stress. You probably knew this but I am going to say it anyway. Dogs do not speak English! They don't even use any sort of vocabulary! I know, that was an obvious statement, but I see people talk to their pets expecting them to understand every single word! - My dog knows this! - He is just being stubborn, he understands what I am saying! No, your pet doesn't understand every word you say but let me tell you a secret. He often "knows" when you are mad or happy, relaxed or stressed because he can read your body language! In this picture one dog is barking at the other dog to get his attention or steal the toy. Even though some times dogs use baking to communicate, their meanings are limited. Dogs spend their whole lives trying to guess what you are trying to tell them! One way to help them is learning about dog training and dog body language. Learning about dog body language will help you see when your canine friend is afraid or relaxed, happy or tired. 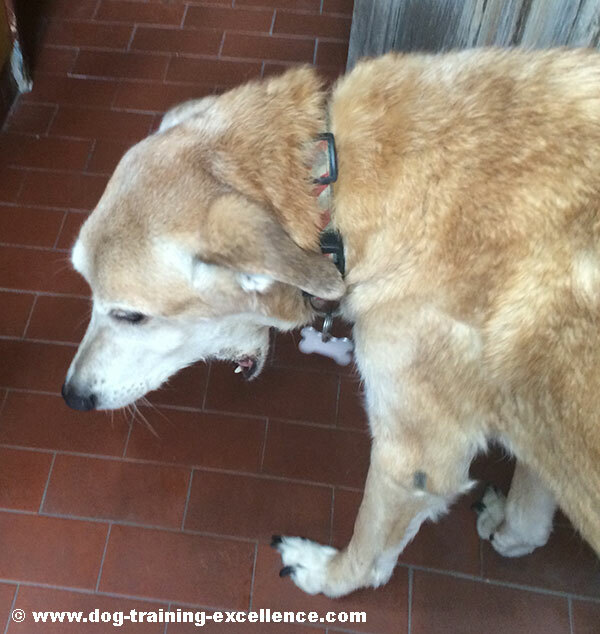 Get your dog out of a threatening situation before he "has to" act by growling or even biting. More importantly get yourself and your pooch out a of threatening situation before being attacked by a strange hound. Dogs communicate with different parts of the body: Head, ears, eyes, mouth, hackles, body posture and tail. Always look at the entire body of the dog: You will learn as we go along that you must look at the dog as a whole when reading body language. 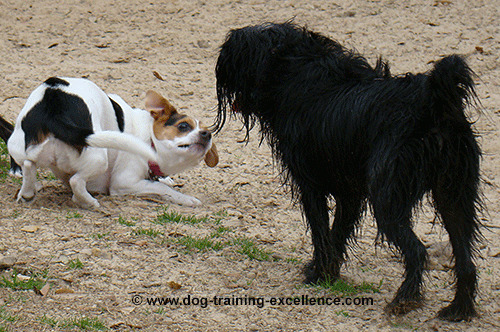 A dog that is "wagging it's tail" is NOT necessarily a friendly dog. Understand the context to understand the dog: Many body signals are subtle and can be seen in many situations, it is important to pay attention to the context (other dogs or threat present, loud noises, strange objects, etc.) to accurately interpret how your dog is feeling. Body signals can be categorized in: calming signals, play signals, fear signals or warning signals. These signals involve several parts of the dog's body, that is why you must look at the whole dog (and the context) before trying to interpret the meaning. Use this information to keep your canine companion safe. That is the mark of a true leader of the pack! Your dog uses "Calming" body signals when he is uncomfortable about a situation. He is not scared or angry yet, just a bit uncomfortable and is trying to calm down himself of the other dog/person. These calming signals can be very subtle but learning them will help you understand your dog better than anyone else. A dog that is fearful will try to avoid getting into a fight. To do this, he will signal with his body that he is afraid and would like you (or another dog) to - please get far away from me! Most people know these signals, but it is good to review them so you can protect your dog and take him away from a threatening situation. A dog that is labelled "aggressive" is most often aggressive because he is fearful but has learned that the only way to make other dogs (or people) go away is by becoming threatening. The dog body language of a threatening dog is very clear, although if the dog has been punished for being aggressive, these signals may become less and less obvious. This is very dangerous because now the dog may bite without any warning. Share a great picture of your dog's body language and tell us what he/she is saying! You can also ask what we think your pet is saying! TIP: Since most people scan Web pages, include your best thoughts; in your first paragraph. You will need to resize any photo larger than 800x600 pixels. You can use any graphics software or a Web-based resizer, such as Picnik. What Other People's Dogs are Saying! Which way is the conference room? My Dog Angelic Looks Can Fool You!